The name Al Ain Class Motors stands for the most exclusive showrooms of the United Arab Emirates. We met the man who collects and gathers sports cars as if they were post stamps to talk about the fascination sports cars. At first glance, you probably wouldn’t notice what stories hide behind the friendly smile of Abdulla Al Ketbi. We managed to have a conversation with him about his business and his passion. This isn’t exactly easy as Mr. Al Ketbi is a very busy man whose life is revolving around trading sports cars. The business man always had a passion for high-performance Mercedes models. He regularly managed to acquire the newest and best Mercedes cars. This caught attention among his friends and business contacts who then asked him if he could supply them with such exclusive cars as well. Hence, Mr. Al Ketbi started to import a small number of Mercedes cars from Germany to the United Arab Emirates in 1992. He was quickly met with a lot of approval for this project which lead to the opening of the first Al Ain Class Motors showroom 1995 in Al Ain, the home town of Mr. Al Ketbi. It was followed by a large expansion. Today, there are five branches, three in Dubai and an additional one in Al Ain. He is also planning on expanding internationally. The daily business of Abdulla Al Ketbi is shaped by a simple concept: “At a very basic level, my business is about relationships.” His daily routine is all about relationships. Because of this, all guests are welcome in his showrooms. He keeps his promises without compromising and treats everyone with respect. Besides courtesy and politeness, Mr. Al Ketbi thinks that knowledge of human nature is essential for daily business. “You can never know who exactly will buy a car”, he smiles. The daily life of Mr. Al Ketbi revolves around the approximately 100 cars which are permanently on stock. 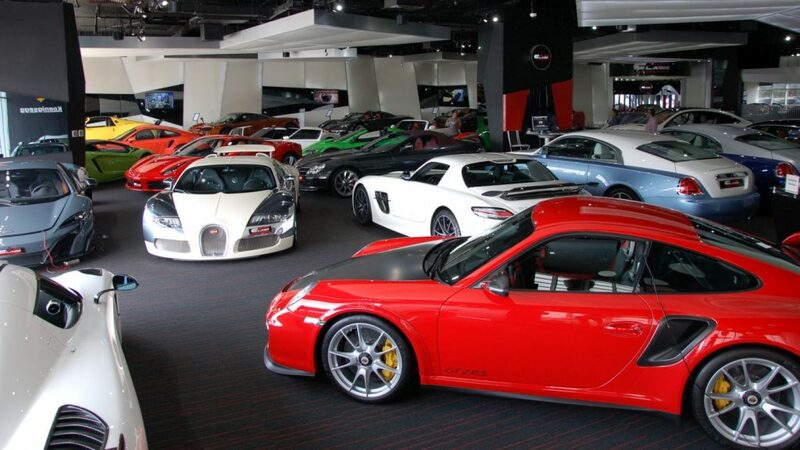 Among them, his showrooms feature some of the most exclusive vehicles in the world of sports cars. For example the Koenigsegg CCXR Special one (there are only two of those in existence worldwide), the Fenyr Supersport, the Maserati MC-12 Limited Edition or the Ford Mustang Shelby GT 500 Fastback, one of the three models used in the shooting of the famous movie “Gone in 60 seconds”. Besides, classics like the Ferrari 458 Spider, Mercedes-Benz SLS AMG and a wide variety of Rolls-Royce models are available as well. While we are talking about the different car models and the business, Mr. Al Ketbi always speaks in a calm and unhurried manner. Still, it is easy to notice that sports cars are his passion. When he talks about the gems in his private collection, a big grin appears on his face and shows that in his heart, he not only is an excellent entrepreneur but above all he is a lover of sports cars. Mr. Al Ketbi owns various curiosities like several Pontiac Firebird Trans-Ams, several Datsun Z and other extraordinary vehicles – just because he likes them or thinks they’re special. Abdulla Al Ketbi shows that passion and profession can absolutely be combined. He doesn’t have problems keeping his feet on the ground, though. As soon as we talk about his business, he gets serious and factual. Customer service is his top priority. His daily business being connected with his biggest hobby only makes this work easier.